In this tutorial we suggest using Google Fusion Tables and Google App Engine to support your ODK project, however we now recommend finding alternatives to these tools. Google Fusion Tables will not be available after Dec. 3, 2019. Embedded Fusion Tables visualizations — maps, charts, tables and cards — will also stop working that day. Learn more. In February 2019, ODK Aggregate v2.x was released with support for Google App Engine removed. You will only be able to install Aggregate v2.x on a standard cloud server (Digital Ocean, Vultr, Linode, Amazon EC2, Google CE, Azure VM) or on a local server. Learn more. Open Data Kit (ODK) is a suite of tools that allows data collection using mobile devices and data submission to an online server, even without an Internet connection or mobile carrier service at the time of data collection. You can collect data remotely without an Internet connection or cell carrier access. Gather text, numeric data, media and more with a mobile device. Then, host your data online using Google's powerful hosting platform, Google AppEngine, and visualize your data as a map using Google Fusion Tables and Google Earth. Created by developers at the University of Washington's Computer Science and Engineering department and members of Change, Open Data Kit is an open-source project available to all. Please visit their ODK project page for more information, recent updates, more tutorials, and to contribute to the project. This data was collected in the field using Open Data Kit. 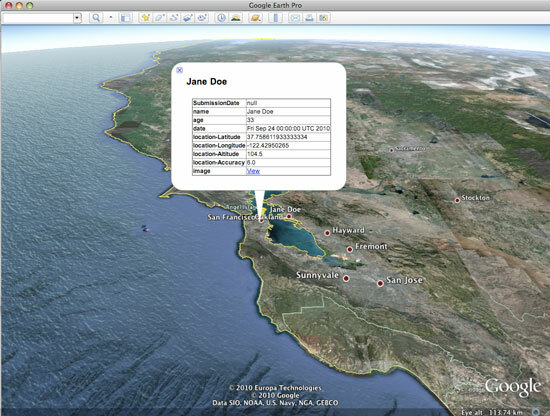 The data is stored in a Fusion Table and displayed in Google Earth. We strongly recommend that you have taken the prior tutorials, Mobile Data Collection using ODK Collect and Manage Your Data with ODK Aggregate. We also recommend taking Getting Started with Mobile Data Collection. In this exercise, we will use a sample form to demonstrate the most common kinds of data you can collect with Open Data Kit and and display with Google Fusion Tables and Google Earth. You can get the sample form on your mobile device by following the instructions in the previous tutorial, Manage Your Data with ODK Aggregate. In the previous tutorials, you learned how to send your form submissions to our instance, or your own instance, of ODK Aggregate. To see the data you added to the form, go to http://odk-tutorial.appspot.com and login using your Google Account. For this tutorial, we will use the data that's been previously collected and uploaded to http://odk-tutorial.appspot.com. The dataset will continuously be added to as more people take this tutorial and add more data. If you upload data to this server, please note that the server has been made public so please don't upload material you don't want others to view. If you collected data using your own AppEngine instance in the last tutorial, feel free to follow along accordingly. ODK Aggregate provides an automatic link to a table that you've created with Google Fusion Tables. Fusion Tables allows you to upload different datasets, merge your datasets, quickly and easily visualize your dataset on a map, and query your data. You can also collaborate with others on your data and set different permissions levels for different users. The mapping functionality of Fusion Tables is covered in more depth in three other tutorials: Map sample data with Fusion Mapper, Map your own data with Fusion Mapper, and Sharing a map from Fusion Mapper. First, you'll need to publish your data from ODK Aggregate to Google Fusion Tables. 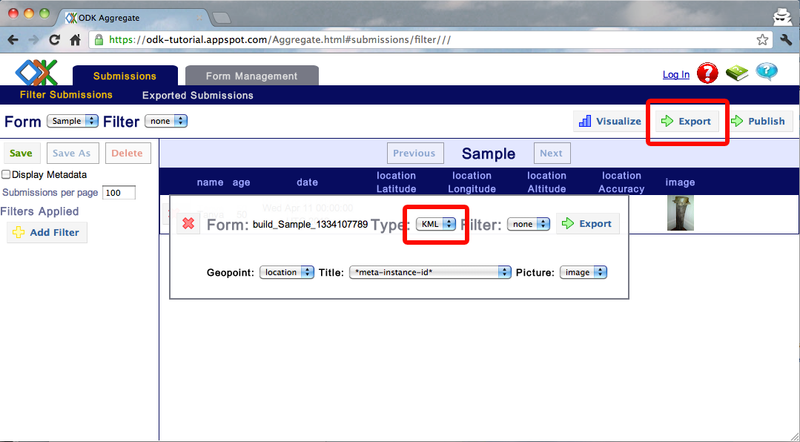 In the “Submissions” tab, under “Filter Submissions,” select the form you wish to export. Then, hit the “Publish” button. Select the service to which you want to create the connection. You can choose from Google Spreadsheets, an online, collaborative spreadsheet tool, or Google Fusion Tables, a lightweight online database with built-in visualization options. You can choose either Google Spreadsheets or Google Fusion Tables. For this tutorial, select Google Fusion Tables. “Upload Existing Submission Data Only” will only upload the existing data you already have submitted to http://odk-tutorial.appspot.com or your own ODK Aggregate instance. “Stream New Submission Data Only” if you want new only submissions to your form to be automatically entered into Google Fusion Tables. “BOTH Upload Existing and Stream New Submission Data” will put your existing submissions into Fusion Tables and continue automatically adding new submissions to your table. You will see the standard message “If you grant access, you can revoke access at any time under 'My Account'. odk-training.appspot.com will not have access to your password or any other personal information from your Google Account.” If you wish to proceed, click “Grant Access.” The connection is created and you'll be returned to the main List of Forms page in ODK Aggregate. Go to Google Fusion Tables at http://www.google.com/fusiontables and log in to view your new table. Note: only you will be able to view your data submissions in your Fusion Tables Google account. From Fusion Tables, you can grant others access in varying degrees to your data (learn how). Select “Map” from the “Visualize” menu. You should see your data points displayed on a Google Map. If there are errors in the data, learn how to Modify your Columns. If the points aren't displaying where you expect them to display, change the “Location” setting in the “Map” view (or visit Help). TIP: If you would like to have photos appear alongside your data submissions on the map, you can do so by using the “Configure Info Window” link at the top of the “Map” view. Learn how to customize pop-up balloons in Google Fusion Tables. 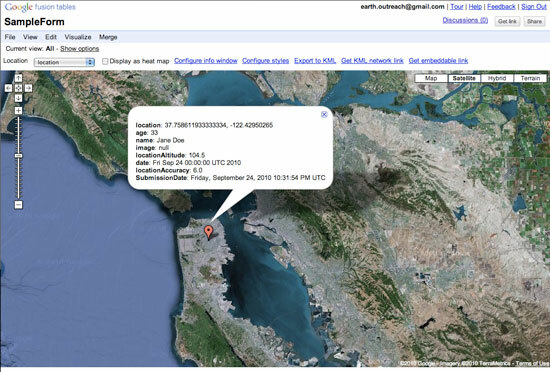 You can also view your data in Google Earth. This is a good alternative to viewing your data in Fusion Tables if you want to add more information to enhance your map, such as points, lines and polygons to better tell the story about your data. Several options will appear. 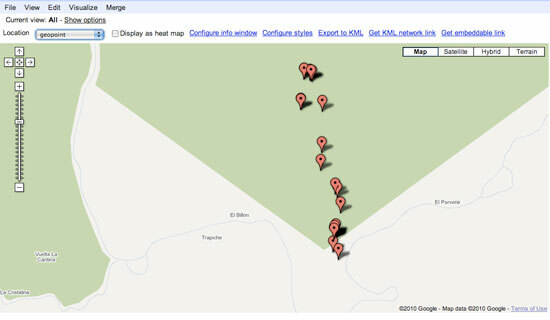 For “Field to Map,” select the field which corresponds to your form's GPS location question. For “Title Field,” select the field that you would like to appear at the top of your Google Earth pop-up balloons. For “Picture Field to Display,” select the field which corresponds to your photo. Then click “Submit,” and your Google Earth KML file will begin downloading. Once the file has finished downloading, double-click the file to open it in Google Earth. You should see placemarks for each data submission. If you click on a placemark to open the pop-up balloon, you should see a table with the data values for that submission. Tip: If you would like to create a connection between your data in Google Fusion Tables and Google Earth, you can do so using a Network Link. First, you must have opted to create an external service connection from ODK Aggregate to Fusion Tables, selecting “BOTH Upload Existing & Steam New Submission Data.” Then, learn how to create a dynamic link from your Google Fusion Tables dataset to Google Earth. Tip: Once you have imported your data into Google Earth, you can add additional points, lines and polygons to tell a story about your field data collection results. Learn how to Annotate Google Earth. If there is historical imagery available for the region you are working in, you can see the changes over time. Learn more about historical imagery in Google Earth. 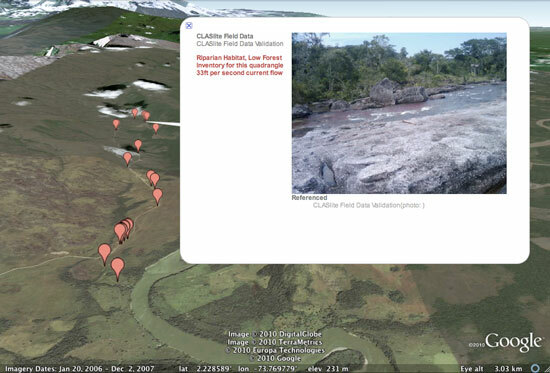 You can also use Google Earth to create a narrated tour to tell the story about the region you are collecting data about, the purpose and goals of your data collection, and the conditions in the field. 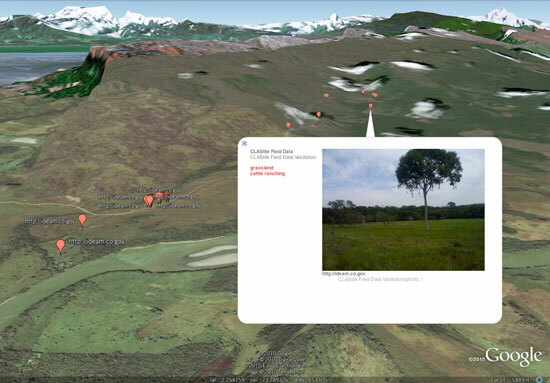 Learn more about creating narrated tours in Google Earth. Congratulations! You have learned how to visualize the data you've collected in the field with Open Data Kit on a map. Have questions about this tutorial? Want to give us some feedback? Visit the Google Earth Outreach Discussion Group to discuss it with others.